Sleeps up to 16 comfortably - beautiful mountain views! Located in a prestigious neighborhood of multi-million dollar homes, this property represents a truly unique getaway experience. With 5 large bedrooms this home is set up to comfortably sleep 16 in beds. The Great Room features vaulted ceilings, Australian Cypress floors and an open floor plan which encompasses the newly renovated kitchen, dining and living areas. A large stone fireplace and 55' flat screen HDTV make this the perfect gathering place for your group. The downstairs living space boasts a 46' HDTV, table for puzzles and games, sleeper sofa, half bath and a wet bar that includes a sink and mini-fridge. Sit back and enjoy the beautiful mountain views from every window of this spacious 3,400 sq. ft home. Watch alpenglow sunsets from the wrap-around deck from the flagstone patio and hot tub that are accessed from the downstairs game room. 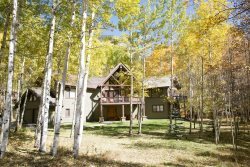 The house is a 3 minute drive to the Crested Butte Mountain Resort base area or .4 miles to the Gold Link homeowners ski trail. In the summer jump on your bike, take a hike right from the home, or walk 2 minutes to the nearby playground & park. This is high country luxury living at its finest! View: White Mtn, Whiterock Mtn. The team members were so friendly. The booklet had all of the information in it that we needed, so there really wasn't a need to call the office. When we did call the office, they were very friendly and worked on the issue in a timely fashion. It was wonderful that everything was already thought of so it was easy and relaxing. This property was AHHHHHHH-MAZING. Everything we needed was there and it was so well done, high end furnishings, plenty of towels, comfortable bedding, and plenty of wares for a full Thanksgiving feast. We were comfortable, it was well laid out, and we had access to use everything including the fireplace, hot tub, and garage- what a treat for a rental property! We rent homes from VRBO, AirBnB, and local services regularly and all agreed this was the nicest one we have encountered! The rental agency was efficient with a proper booklet of information about the area and the house, email communication leading up to our rental dates was good, and when we called to report a minor issue that was noticed about a door handle they took care of it without hassle. The property was exquisitely clean upon arrival and was our goal all week to maintain. Checkout was a breeze with simple instructions before departure- it was so nice not to have to spend 3+ hours of cleaning before we left and was very convenient. The location of the home was spectacular- close to the slopes, easy drive to the town, great views, and remote enough that we had the best night stargazing we have had in years! Our only hope now is that we were good enough tenants to be allowed back- it was an honor to use this house. Thank you to the owners and rental company, this was just an amazing trip and we would recommend this to anyone and everyone! The house was beautiful and perfect for our family. We loved sitting on the balcony and in every direction we looked we had the most breath taking views. Beautiful mountains ranges, horses grazing in the valleys, and every where we looked there were outstanding beautiful wild flowers in every color, plus the landscape at the house was excellent. We chose to celebrate our 50th wedding anniversary with our three daughters, son in laws, and 8 grandchildren. It was a wonderful experience for all and everyone had a wonderful time. It was wonderful watching our grandchildren having the time of their life and were so thankful to be in the mountains for the first time. We spent our honeymoon in Colorado and as our children grew we came back many summers to hike and winters to ski. We have watched Crested Butte grow. We all love coming back. It definitely was a great idea for our anniversary and shall forever be special in out hearts. Thank You! MANAGER RESPONSE: Dorothy, it was a pleasure working with you to plan this special trip for you and your family. We are so glad the home was the perfect setting to create lasting memories for you and your family.